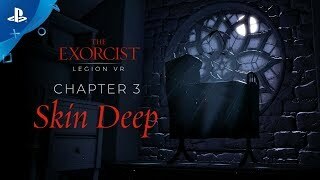 Created especially for virtual reality, The Exorcist: Legion VR is an episodic experience set in the Academy Award-winning world created by horror maestro William Peter Blatty. Each chapter features a unique demonic entity that will test your courage and resolve. Not for the faint-hearted. 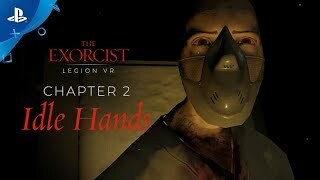 The Virtual Reality Adventure Based on the "Scariest Movie of All Time"
Be the hero of your own virtual reality adventure! Your story begins as a Boston homicide detective tasked with investigating the ritualistic murder of a local priest. What you discover at the crime scene compels you on a perilous path of discovery that will help you to complete the slain priest’s work. As you embark on your new path, you discover dark forces at work whose only goal is the complete destruction of humanity. A place of worship covered in blood, a notebook filled with writings of demonic possession and the "ritualistic murder" of a priest. Will you answer the call to investigate? In Chapter 2, your task is to visit Lucie Moss, a mentally-ill school teacher whose dangerous flirtations with the occult exposed her to a malicious entity intent on twisting her mind and devouring her soul. What torments her? How can the arcane tools you’ve found aid you in your journey? A wave of infant mortality has struck and a number of distraught parents have posted online, claiming to have heard the sound of an old woman calming the cries of their babies in the weeks before. A copy of one such recording landed on your desk. Can you calm the cries before it is too late? Haiti has become a failed quarantine zone. Wracked by an unknown plague, a slew of health-worker deaths have led to the collapse of efforts to control the mounting victim toll. You travel to a small aid center to discover what (or who) lies at the heart of the epidemic. 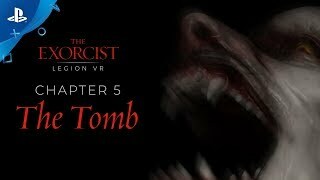 The Exorcist: Legion VR features a variety of unique demons that make up the "Legion." The taker of old souls; his work is to harvest the weak, decrepit and those near to death. It is said that he tortures his prey: first through mind games, disorientation and stress; then the real pain begins with physical abuse delivered from hellish flames. The infertile devil who has been blamed for infant mortality throughout the history of civilisation. Many cultures have encountered her and she has been given many names, from Lilith in Hebrew to Medusa in Greek. She does not sleep, her domain is the night. She is envious and feeds on the unwanted. The bringer of lightning, wind and rain; he manipulates the elements to bring plague, pestilence and disease. The scale of his power is formidable, he is thought to be the source of many historic disasters. The demon of the southwest wind and the head of the snake. Traditionally he is known as the bringer of famine and locusts, but modern scholars believe him to be something much more insidious - as he picks away at any belief a person holds dear, through corruption, hate and fear. Multiple episodes, each featuring a different demonic entity and a completely new setting. 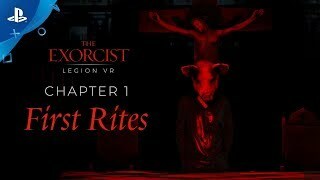 Realistic, sinister and completely immersive virtual environments hide rich story clues and a variety of unique secrets. Find and use a several trademark exorcism tools as well as hidden “artifacts” that aid you on your quest. Collect special items in your evidence room. Receive cryptic packages from a mysterious stranger who seems to know your every move. Each chapter runs approx. 25-30 minutes, allowing you to complete a full exorcism in one session. Replay each chapter for additional secrets, achievements and performance. 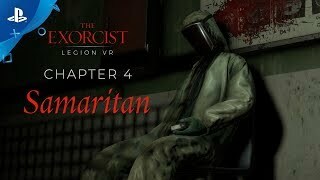 In The Exorcist: Legion VR Complete Series you will face a variety of supernatural entities as your journey begins in Boston and ends in one of the darkest, most forgotten places imaginable. This collection includes 'Chapter 1: First Rites', 'Chapter 2: Idle Hands', 'Chapter 3: Skin Deep', 'Chapter 4: Samaritan' and 'Chapter 5: The Tomb'. 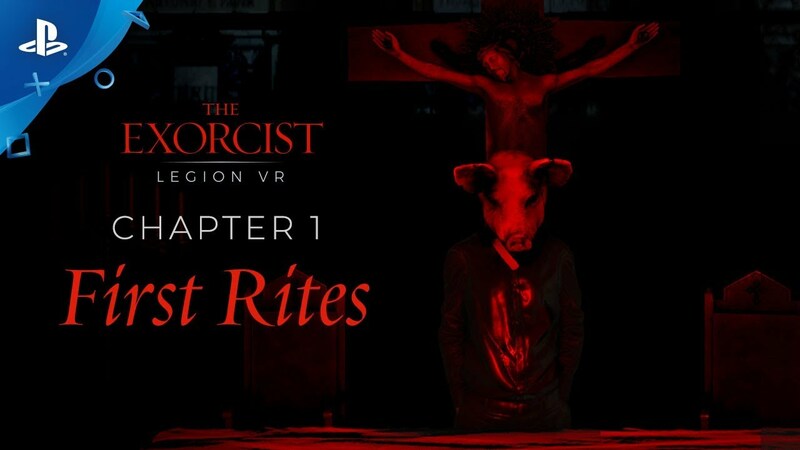 Buy Chapter 1: "First Rites"
Buy Chapter 2: "Idle Hands"
Buy Chapter 3: "Skin Deep"
Buy Chapter 5: "The Tomb"
The Exorcist III and all related characters and elements are trademarks of and © Morgan Creek Film Partners I, and LegionVR, LLC, a Fun Train company. Trademarks belong to their respective owners. All Rights Reserved.This is a work of fiction which is protected under the copyright laws of the United States and other countries throughout the world. Country of first publication: United States of America. The story, all names, characters, places and incidents portrayed in this production are fictitious. No identification with actual persons (living or deceased), places, buildings, and products is intended or should be inferred.